(Phys.org)—Researchers from the University of New South Wales and the University of Adelaide in studying fossils of Nimbadon lavarackorum, an extinct wombat-like marsupial, have concluded that the animal likely lived among the treetops of Australia's rain forests approximately 15 million years ago. The new research is based on an analysis of bones discovered in a cave in the Riversleigh in north-west Queensland, the team explains in their paper published in the journal PLUS ONE, and make N. lavarackorum, at approximately 150 pounds, the largest herbivore to have lived in the forested canopies that once flourished in the area. N. lavarackorum belonged to a family of large marsupials known collectively as diprotodontids that all went extinct approximately 11,000 years ago as Australia became drier. N. lavarackorum is believed to have lived during the Middle Miocene, which spans 11.6 to 16 million years ago. The bones examined belong to a collection of 26 different specimens retrieved from a cave in the years following their discovery in 1993. The large group apparently fell into the cave for unknown reasons. 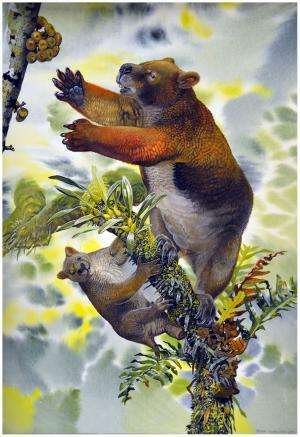 In studying the collection of bones and comparing them to other fossils as well as the bone structure of modern animals, the researchers found that parts of N. lavarackorum very closely resemble parts of the modern Koala, which of course lives in trees. Both have very mobile elbow and shoulder joints, big claws and very strong forelimbs – all characteristics necessary for living in trees. They also found that the back end of the animal more closely resembled that of a modern orangutan – strong short hind legs and strong gripping feet that would have allowed it to hang upside down if need be to reach far hanging fruit. It also had a large bulbous nose that presumably helped it sniff out food. What's most remarkable about N. lavarackorum the researchers note, is its size, roughly that of modern humans. Virtually all other mammals of its size that lived in the area during the time when much of Australia was covered with rainforests were ground dwellers – it's also the only member of Diprotodontidae believed to have lived in trees.